Although the first military submarine operated as early as 1775 and development continued throughout the 1800s, the submarine was really a creature of the twentieth century; it was the submarine and the aircraft carrier that defined naval warfare in that century. The method of propulsion for the first half of the century was the diesel-electric system. Standard diesel engines were used for general operation on the surface but could not be used while submerged because of the enormous amount of air required for combustion. 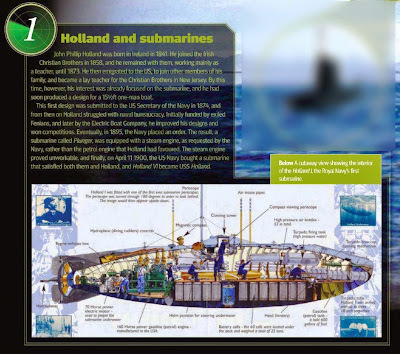 The submarine would only dive to attack or avoid detection, at which time the boat switched to power provided by electric batteries, charged from the diesels while on the surface. 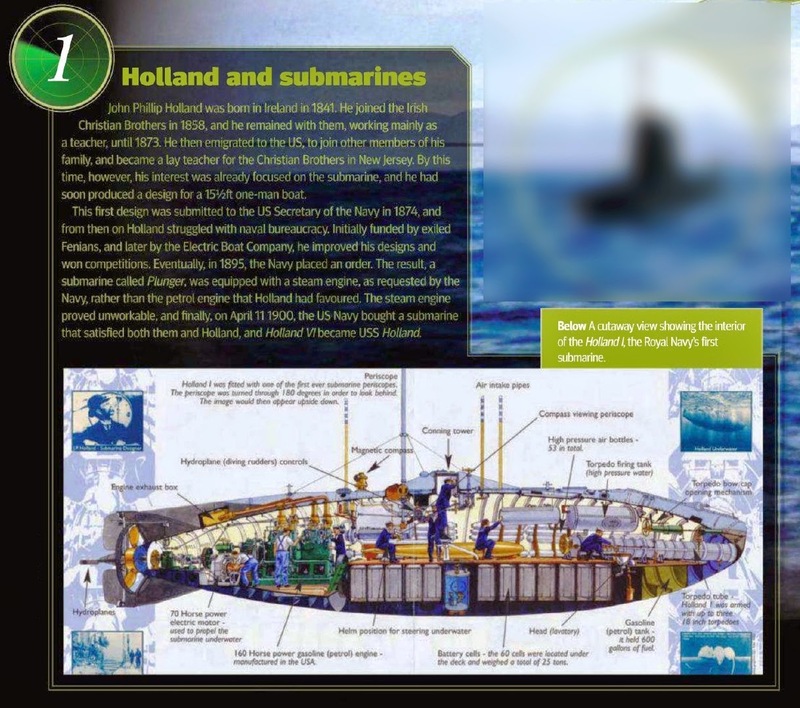 Most submarines were double hulled, with water filling the space between the two hulls while submerged. The weapon that made the submarine useful was the self-propelled torpedo, powered by compressed air, which provided the sub with a deadly and stealthy attack. These technologies have been supported by countless others, each complex in its own right: atmosphere regeneration, escape and rescue techniques, underwater communications, weapons guidance, electronic countermeasure, and countless others, but all technologies unique to the military submarine revolved around one concept: avoiding detection by stealth. WWII Experience – just enough material to create the base line on submersible versus true submarine. In World War II, the critical Battle of the North Atlantic was a struggle defined by the technological accomplishments on each side as Germany’s U-boat force sought to avoid detection from the eyes and ears of Great Britain’s anti-submarine warfare (ASW) force. In the efforts at stealth and avoidance of detection, the most significant developments were the deployment of ASDIC (for Anti- Submarine Detection Investigation Committee), or sonar, followed closely by airborne radar. The most deadly enemy of the submarine turned out to be aircraft, which could detect surfaced submarines by means of radar allowing an attack with bombs or, as the submarine dived, depth charges. The U-boats countered British radar with a radar detector called Metox that warned of attack, but the British eventually deployed a new radar using a centimetric wavelength undetectable by Metox. The Germans did not discover the use of the new radar and were slow to develop an effective counter. U-boat losses continued to rise. As a stopgap measure the Germans deployed the schnorkel, developed before the war by the Dutch but captured by the Germans upon the surrender of the Netherlands. The schnorkel, or snorkel to the Americans and snort to the British, was a simple device—a breathing tube that could be raised similar to a periscope that allowed the submarine to run its diesel engines while submerged. While technologically interesting, its practical deployment was a failure; Allied radar could soon detect even the schnorkel protruding from the water. A submarine is only as effective as its weaponry is reliable, and World War II saw examples of massive weapons systems failures. In the Norwegian campaign of 1940, the earth’s magnetic field interfered with the operation of the U-boats’ magnetically armed torpedoes. German U-boats operating off the Norwegian coast aimed torpedoes at unsuspecting British capital ships only to hear their duds clank off the sides of the targets. In the Pacific, American submarines were armed with hopelessly defective torpedoes that rendered the American submarine fleet useless for many months until the flawed torpedo design was corrected. When effective torpedoes reached the American subs, their effect was devastating. The Japanese never developed an effective ASW force or doctrine, and U.S. subs ran wild, destroying over 60 per cent of Japanese merchant shipping and paralyzing the import-constrained Japanese economy. While less well known than the great carrier battles and island invasions, the U.S. submarine force contributed at least as much to the defeat of Japan. WWII submersible limitations. Sub to sub warfare before the TRUE submarine. Many subs sank subs during the WWII. In fact, subs were among the most effective sub killers in WWII. But, WWII torpedo technology was relatively primitive - in general they ran at a fixed depth and along a fixed, straight line. Hitting a fully, deeply submerged submarine (one NOT on the surface, or just below it at periscope depth) would be a million in one shot both because of the added third dimension and because technology of the day (sonar) was not accurate enough to get an exact fix on a deeply submerged sub for a torpedo shot. In both World wars, subs sank each other either when both were on the surface, or when one was at periscope depth and the other on the surface. In other words, subs sank subs the same way they sank surface ships; on the surface. ONE time, a submerged sub sank a submerged sub. A British sub, the Venturer, at periscope depth, sighted and sank a German U-boat (the Type IXD2 U-864), traveling on schnorkel (at periscope depth) off the coast of Bergen (on the way to the Far East). Again, this was not a truly submerged versus submerged attack, as it used standard sub vs. ship attack methods (though with a deep depth setting on his torpedoes). (Source: "Hitler's U-boat War" Vol II, Clay Blair, pg 692). Details: As Venturer continued her patrol of the waters around Fedje, her hydrophone operator noticed a strange sound which they could not identify. The hydrophone operator thought that the noise sounded as though some local fisherman had started up a boat's diesel engine. Launders decided to track the strange noise. Then, due to poor adherence to proper periscope usage protocol on the part of U-864's crew, the officer of the watch on Venturer's periscope noticed another periscope above the surface of the water. Combined with the hydrophone reports of the strange noise, which he determined to be coming from a submerged vessel, Launders surmised that they had found U-864. Launders tracked U-864 by hydrophone, hoping it would surface and allow a clear shot. But U-864 had detected the presence of an enemy submarine, and remained submerged, starting to zigzag. This made U-864 quite safe according to the assumptions of the time. Launders continued to track the U-Boat. After several hours it became obvious that she was not going to surface, but he needed to attack it anyway. It was theoretically possible to compute a firing solution in three dimensions, but this had never been attempted in practice because it was assumed that performing the complex calculations would be impossible. Nevertheless, Launders and his crew made the necessary calculations, made assumptions about U-864's defensive manoeuvres, and ordered the firing of all torpedoes in the four bow tubes (as a small, fast-attack boat, Venturer was equipped with only four tubes in the bow, none in the stern, and carried a full complement of only eight torpedoes), with a 17.5 second delay between each shot, and at variable depths. U-864 performed a crash dive, straight into the path of the fourth torpedo. U-864 instantaneously imploded with the loss of all hands. This site lists 20/21 U-Boats sunken by allied subs. Other sources lists up to 25. THE TYPE XXI-THE GAME CHANGER. At end of WWII the German Type XXI was theoretically able to work up a firing solution by sound without visual help. The war ended before the Germans could deploy their own next wave of technology embodied by the Type XXI ‘‘Electric’’ boat, with much larger battery capacity that gave it a fast underwater speed. Until late 1944 Allied bombing had a disruptive rather than disastrous impact on the Type XXI program. The situation changed radically in 1945 when massive raids resulted in the destruction not only of U-boats still on the ways but also of completed U-boats fitting out, or, in some cases, after commissioning and while undergoing training. Thus, quite apart from the damage to construction facilities, 17 completed Type XXIs were sunk in harbour between December 31, 1944 and May 8, 1945: Hamburg – seven; Kiel – six; and Bremen – four. In essence the Type XXI simply introduced too much that was new simultaneously and demanded too much of those involved in the program. The reasons for this were diverse. In part it was due to the impending defeat on the high seas and the desire to do something – anything – to prevent it. There was also a fascination in Germany for anything that was new and militarily impressive. With hindsight, there also appears to have been an air of unreality about many activities and decisions, some of which may have been due to the pressure of work and others plain ‘woolly thinking’. Unfortunately for the Kriegsmarine, the outcome of all the pressure and cutting of corners was that the boats that were actually completed were constantly having to return to the yards for repair and modification, resulting in delays in attaining full service stratus. During World War II the submarine’s principal roles were commerce destruction and hunting enemy surface warships. The antisubmarine forces of the United States and the British Commonwealth comprehensively defeated the submarine campaigns of both Germany and Japan against both merchant shipping and naval forces with a combination of superior tactics and technologies. Nevertheless, it was clear that new submarine technologies could potentially negate this superiority. In particular, the advent of the German Type XXI submarines, the elektroboote, was especially worrying. They combined high underwater speed, rapid manoeuvrability, substantial submerged endurance, deep diving, and long range without needing to surface. These attributes resulted from the installation of greatly enlarged batteries and more powerful electric motors in a shorter, deeper, stronger, streamlined hull, and the use of snorkels to operate the main diesel engines underwater. While the Type XXI did not represent a mature technology, its potential was clear, and its design features powerfully influenced submarine development after World War II, especially in the United States and the Soviet Union. The advent of the Cold War forced a thorough reappraisal of the role of submarines in the fleets of the United States and its allies. Maintenance of maritime commerce, the movement of troops, munitions, and equipment across the oceans to Europe and the Far East, and the forward deployment of powerful naval surface forces, centred mainly on aircraft carriers, all were vital components of the West’s strategy for containing the Soviet Union and for conducting operations should a war break out. The deployment of mature submarines with the capabilities of the elektroboote potentially could jeopardize the West’s ability to undertake all three. One part of the solution to countering fast, true submarines was the deployment of fast, effective surface and aerial antisubmarine assets, but that addressed only containing and defeating submarines once they had reached the open ocean. The other, and potentially more efficient, option was to deploy the West’s own submarines to hunt and kill enemy submarines before they could reach the oceans, and that therefore became one of the submarine’s primary missions. The Soviet Union also had to re-evaluate the purpose of its submarine force. One primary role quickly emerged: defending the nation’s coast and ports against attack through offensive operations against the West’s surface maritime assets—especially carrier forces and oceanic lines of communications—and defensive operations against submarines attempting to prevent the egress of Soviet boats. Both sides in the Cold War quickly came to view enemy submarines as the primary target of their own boats, especially as both began deploying submarines as platforms for strategic missile attack against the other’s homeland; in addition, the Soviet Union also placed great emphasis on offensive missions against the West’s carrier groups. At the beginning of the Cold War, all operational submarines used diesel-electric drive. This required submarines either to surface frequently to recharge their batteries, or that they be equipped with a snorkel breathing device. The initial primary focus of submarine development, especially in the United States and the Soviet Union, was the integration of experience from analysing and operating the German elektroboote into their fleets. The U.S. Navy took a three-track approach to this task. The first, longer-term approach was to explore new propulsion technologies that would free submarines from the limitations of diesel-electric drive; this led to the introduction of nuclear-powered boats. The second was to develop new designs that embodied the principles of the Type XXI boats within the framework of U.S. requirements. New long-range submarines of the Tang class and short-range hunter-killer types emerged, but their numbers fell far short of the fleet’s requirements. To a great extent, however, budgetary constraints forced the U.S. Navy to pursue most vigorously the least attractive option: modifying, through the GUPPY program, as much as possible of the large existing fleet of new but obsolete submarines built during World War II for greater speed and underwater endurance. Large numbers of almost new Gato, Balao, and Tench class fleet submarines received more streamlined casings and sails, enlarged batteries, snorkels, and improved sensors to suit them for submerged operation for more extended periods. The United States also undertook research on improved hull forms for extended high-speed submerged operation, leading to the construction of the experimental Albacore by the Portsmouth Naval Shipyard in 1952–1953. The Albacore was revolutionary: the hull was a teardrop shape, optimized for underwater operation; there was a single propeller; and the installation of a massive battery permitted very high submerged speed, albeit for only short periods. The new hull form demonstrated great manoeuvrability, and exploiting it led to substantial improvements in subsequent submarine control systems, making them more akin to flying an aircraft than operating a boat. The Albacore also was subject to many modifications, especially to the stern, which eventually received an X-tail that increased overall length to 210’ 60”; several different types of propeller and rudder arrangements were tried, and the boat also tested new configurations for sonar installations. The new shape demonstrated by the Albacore quickly found its way into operational submarine service, both for diesel boats and for nuclear-powered submarines, in the United States and elsewhere. Its wide adoption marked the completion of the process of transformation from submersible surface craft to full submarines. In the United States it found its principal application in the development of nuclear-powered boats; only the three diesel-electric submarines of the Barbel class took advantage of its characteristics. The Soviet Union followed a somewhat different course in developing its new submarine fleet. In many ways it was far more conservative, from a design standpoint. Essentially, it chose to integrate the principles of the elektroboote into the design of updated iterations of the existing three basic types: coastal, medium-range, and long-range boats. Unlike the United States, the Soviet Union put these new designs into mass production, building 32 coastal Project 615 ( NATO-designated Quebec) boats, more than 200 Project 613 ( NATO-designated Whiskey) medium submarines, and 22 of the long-range Project 611 (NATO-designated Zulu) type. The Soviet Union also explored new submarine propulsion technologies and adopted nuclear power some four years after the United States. Unlike the United States, however, the Soviet Union did not end production of conventionally powered submarines. Large numbers of new diesel-electric Project 633 (NATO-designated Romeo) and Project 641 (NATO-designated Foxtrot) boats, again of relatively conservative design, were built to supplement the earlier Project 613 and Project 611 types. Both types nevertheless were successfully exported to countries within the Soviet sphere of influence and laid the basis for conventional submarine production in both China and North Korea. The Soviets in addition saw a role for conventionally powered submarines in the anti-carrier mission, manifested in the production of the Project 651 (NATO-designated Juliett) and Project 641BUKI ( NATO-designated Tango) boats in the 1960s and 1970s, whose principal weapons were anti-ship cruise missiles. The earlier type saw operational characteristics on the surface take pride of place, inasmuch as it had to surface to launch its missiles and needed stability for that purpose. The missiles of the later boats were launched while it was submerged, and consequently a modified form of the earlier Project 641 attack submarine hull was found satisfactory. The Royal Navy took a somewhat different approach to new submarine production immediately after World War II. Alone among Allied navies, it had direct experience in creating submarines with high underwater speed during the war, having converted several S class boats into high-speed targets for antisubmarine forces. It used that experience, plus additional information derived from study of the German elektroboote, to generate its own conversion program to build up a force of fast boats from recently completed T and A class submarines, while working to make more radical propulsion technologies reach production maturity. The Admiralty looked into nuclear propulsion but decided to exploit the German Walther close-cycle turbine system for its non–air breathing submarines, because it seemed less expensive and closer to being ready for service. Unfortunately, British experts were under the impression that German technicians who had tested this system in a small number of experimental platforms were much closer to solving all of its problems than was really the case. The Royal Navy built two special experimental boats, the Explorer and the Excalibur, as platforms to bring the Walther system to production status; in the meantime, they built new conventional submarines that, while very reliable and generally quite effective, did not represent much of an advance on the conversions of wartime boats or the German elektroboote. The failure of the work in developing a mature Walther system left the Royal Navy no alternative but to turn to the United States for nuclear power technology when the time came for it to build its own submarines that would be free from the limitations of diesel-electric propulsion. In the early 1980s the Soviet Fleet introduced a new conventionally powered attack submarine, in large part because it was easier to create a quiet diesel-electric boat. The Project 877 (NATO-designated Kilo) type was specifically designed for antisubmarine warfare and combined a teardrop hull form with a powerful sensor suite and stringent measures to reduce acoustic and magnetic signatures. These relatively large, conventionally powered boats proved very successful. They were among the quietest boats of their era and also became a considerable export success, both in their original form and as the upgraded Project 636 (also designated Kilo by NATO). For most other nations the leap to nuclear power for submarines was out of the question, because of the absence of the necessary industrial and scientific infrastructure, its great expense, and, in some instances, political obstacles. Instead, they exploited the elektroboote technologies to produce a new first generation of Western, conventionally powered fast submarines. The second generation of post-war diesel-electric boats represented a substantial advance on the earlier types. Three elements combined to create these new boats: great strides in battery technology, new hull forms inspired by the Albacore design, and advances in reducing acoustic and magnetic signatures. New battery designs not only generated more power for the same space and weight but also recharged much faster, enabling submarines to operate fully submerged for longer periods and use their snorkel on a much more limited scale. New hull forms, and advances in metallurgy, endowed these boats with higher speed, greater manoeuvrability, and deeper diving capabilities. Reduced magnetism came from using nonmagnetic, high-tensile steel or active demagnetizing. The biggest asset, however, that these later-generation diesel-electric boats possessed was quietness and, therefore, stealth. Rafted machinery, slow-speed motors, advanced propeller designs, sophisticated streamlining, and anechoic hull coatings all dramatically reduced their acoustic signatures. When combined with their small size, especially relative to nuclear-powered submarines, and thus an ability to operate in confined waters, this stealth made later diesel-electric boats very difficult targets for aerial, surface, and subsurface antisubmarine forces. Several producers of advanced conventional boats were able to turn these assets into lucrative export production. Beginning in the 1970s, France, Sweden, and above all Germany began to dominate the market for advanced conventionally powered submarines worldwide. The most successful by far is the family of German Type 209 submarines, of which almost 60 have been delivered or are on order for 15 nations. Moreover, since many of these export boats were ordered by fleets without solid experience of modern submarine operations, lucrative training and support contracts often accompany the orders for the hardware, and contribute to the spread of a remarkably uniform ethos of operation. Ambitious German plans to build Walter-designed ocean-going submarines, such as the 1,600-ton Type XVIII, were thwarted by the unsuccessful course of the war, The Type XVIII was modified into the highly successful Type XXI "Elektroboots" ["electro-boat"] in which larger batteries provided a submerged speed of 17 knots, which could be maintained for 90 minutes. That innovation, and the adoption of the snorkel, yielded a potent combination that strongly influenced the post-war design of conventionally-powered submarines on both sides of the Iron Curtain. Type XXI U-boats were the first submarines designed to operate entirely submerged, rather than as surface ships that could submerge as a temporary, awkward mode of operation. Following the Second World War the German U-Boat technology provided the Soviet Navy with technological improvements. The German Type XXI submarine was capable of 18 kts submerged, could dive to nearly 1,000 feet and included a schnorchel (snorkel) mast to allow for diesel operations and battery charging while submerged. During the five years following the end of World War II, Soviet exploitation of the Type XXI lagged significantly behind American fears. US intelligence initially foresaw in 1946 a force of 300 Soviet Type XXI equivalents by 1950. But it was not until 1949 that the first post-war Soviet submarine designs -- the Whiskey and the Zulu -- put to sea. The Zulu was a true Type XXI, equipped with a snorkel, capable of 16 knots submerged, and possessing the size, habitability, and range necessary for long range, blue water interdiction operations. But only 21 Zulus were commissioned between 1949 and 1958. During the 1950s, including efforts to convert Zulus into ballistic missile submarines (SSBs). The world's first SLBM submarines were the Soviet Zulu-class, diesel-electric-propelled vessels armed with two SS-N-4 missiles. These undersea craft, converted to the SLBM role in 1958-1959, were followed by the new-construction Hotel (nuclear) and Golf (diesel) classes, each of which carried three missiles. The Soviet Navy never lost faith in the SSK, and continued to build them in parallel with SSNs. When the huge Project 613 ‘Whiskey’ programme came to an end in 1958 no fewer than 215 had been built, and 21 more were assembled in Chinese yards. The improved Project 633 ‘Romeo’ type never achieved the same popularity - 20 being built in 1956-64 for the Soviet Navy and others built for export. The Project 611 ‘Zulu’ type, a 1930.5-tonne (1900-ton) ocean-going boat, ran to 30 units, but large-scale production returned with the 62 Project 641 ‘Foxtrots’ built from the early 1960s to 1971. The 19 Project 641 BUKI ‘Som’ class (’Tango’) were specialised antisubmarine boats built from ‘Foxtrot’ components. Very much like the battery capability given to the Tang class by the Americans to achieve the kind of speed displayed by the German Type XXI’s at the end of World War II, this boat had an increased number of batteries that provided the capability of remaining submerged for 300 hours at very slow speed. The Romeo also had hovering capability. In many ways, it was the ideal pre-nuclear surveillance boat. These vessels came off the ways in the late 1950s, roughly the same time as the advent of the first Soviet Nuclear boats, the November class. Each phase in the evolution of Soviet submarine capabilities created a new challenge for American ASW forces, and the next four sections briefly assess how well each such challenge was met, focusing on identifying innovations in technology and doctrine for ASW when they occurred. The Second Battle ended as the Germans were deploying a new type of submarine designed to counter the ASW techniques used by the Allies to defeat their wolf packs operating on the surface. Known as the Type XXI, it combined three design changes to enable a radically new operational approach focused on submerged operations. These changes were greater battery capacity, a hull form more hydrodynamically suited to high underwater speed, and a snorkel allowing the main diesel engine to breathe from periscope depth. The Type XXI undermined each element of the Allied ASW posture that won the Second Battle. The snorkel, which had a much lower radar cross section than a surfaced submarine, gave the submarine back its tactical mobility. That is, it could once again move at speed on its main engine for great distances without molestation by air ASW forces. A more hydrodynamic hull and greater battery power allowed a completely submerged submarine to go faster for longer than before, allowing it to escape prosecution by sonar-equipped convoy escorts once it had revealed its position by attacking. At the operational level, Type XXIs deployed in sufficient numbers to blanket the North Atlantic shipping lanes would minimize the need for shore-based command and control, and, to the extent that two-way communications between deployed submarines and headquarters remained necessary, they could be executed using the new "kurier" burst transmission technology introduced by the Germans at the end of World War II. Burst transmissions compress HF signals enough to make it difficult to DF them. Combined with the likely absence of a code-breaking triumph, such as Ultra, a future battle of the Atlantic would therefore be prosecuted without much of the operational intelligence of opposing submarine operations that the Allies enjoyed in the Second Battle. 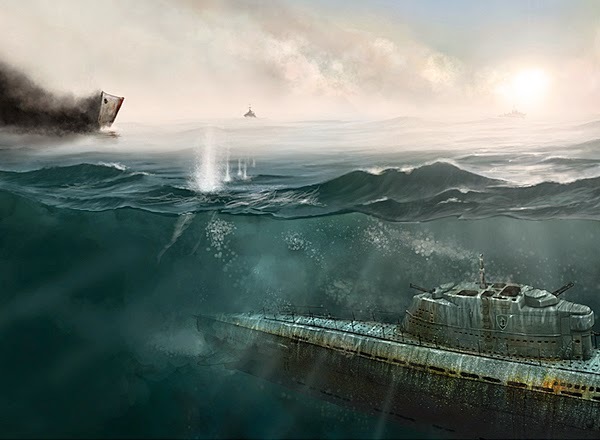 Type XXIs had fallen into American, British, and Soviet hands after World War II, and the U.S. Navy rapidly discovered that it would face a major ASW challenge were the Soviet Navy to build large numbers of ocean-going Type XXIs. In anticipation of this threat, Chief of Naval Operations Admiral Chester W. Nimitz identified ASW as equal in importance to dealing with the threat of atomic attack. The resulting ASW response to the fast snorkel threat initially unfolded in two basic directions: an evolutionary path that sought to repair the ASW team that won the Second Battle and a more revolutionary path that aspired to replace it. 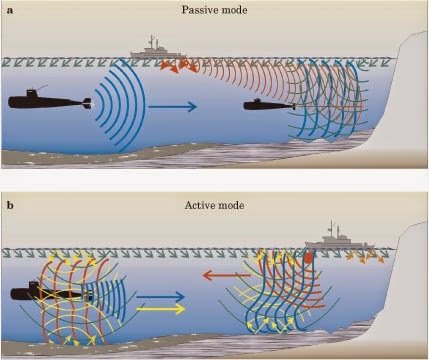 The evolutionary response to the fast snorkel boat emphasized at the technical level better radars for air ASW assets, better active sonars for surface escorts, and better weapons for both, along with a tightly integrated tactical approach that sought to exploit the strengths and compensate for the weaknesses of each ASW platform. This approach took advantage of the fact that a snorkel boat still was not a true submarine in that it remained at least partially wedded to the surface, albeit in a fashion that greatly reduced its vulnerability. The more revolutionary response introduced both a new sensor and a new platform into the ASW equation. The new sensor was the passive acoustic array, and the new platform was the ASW submarine, or SSK. American passive acoustic array development grew out of earlier German developments, in this case the GHG array first used on a limited basis as a torpedo-self-defence sensor on German surface ships, and later adapted for use by Type XXIs as a means of tracking and targeting surface ships for torpedo attack while submerged. Fortuitously, the U.S. Navy discovered in early post-war exercises that submarines were quite loud when snorkelling. Compared to a surface ship, a snorkelling sub put all of its machinery noise into the water because it was submerged, and if it was to make best progress during transits to and from its operating areas or keep up with a fast convoy, it needed to operate at speeds well past the onset of propeller cavitation at such shallow depths. For both reasons, it was an excellent target for a quiet platform deploying a large, low-frequency passive array.